It’s now only five weeks until Nat and I board a plane for Mauritius. 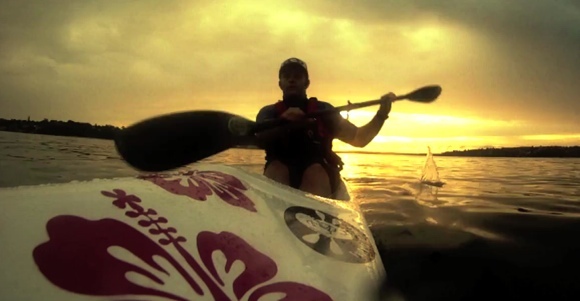 The past five months have been intense, as I’ve attempted what last December seemed impossible – lose weight, get fit, and learn to paddle a surfski well enough to survive the 28km ocean race that is the Mauritius Shamaal. It hasn’t been an easy road. In the first four months I lost 25 kgs, through a combination of diet and exercise. That’s some serious weight, and for those that were close to me, they know how hard I had to work to get it off. This included hours each week in the gym, foresaking all food of any remote flavour and all alcohol, and a seriously tough core-strengthening regime that involved many painful sessions with kettle bells. It also meant time in a surfski, with the Stellar SR my ride of choice. I’ve fallen off her maybe a hundred times. I’ve paddled her across rivers, lakes, bays and on the ocean. I’ve learned to catch runners and surf breakers, and even learned how to keep upright when side-surfing (well, sometimes!). I have no idea if I’m close to being prepared enough for Mauritius. I’ve had no-where near enough time on the ocean, and long hours in a new job are preventing me from training as much as I’d like. Still, in 5 weeks time I’ll be going, so I guess time will tell. Truly inspiring path to get to where you are at. Thanks Grant. I guess now you’re playing with Jimsquad there will be plenty of surfskis for you to play with! What the plans for 2013…I am thinking paddle accross Lake Eyre if its full. …120km.. A guy and his wife did it last year! Great work Sean ! Good luck in Mauritius ! Go FP! So proud of your efforts so far mate. You’ll be awesome. You’re bloody strong and bloody light now. Have fun doing it, but don’t forget what you put in to get there. Go HARD!